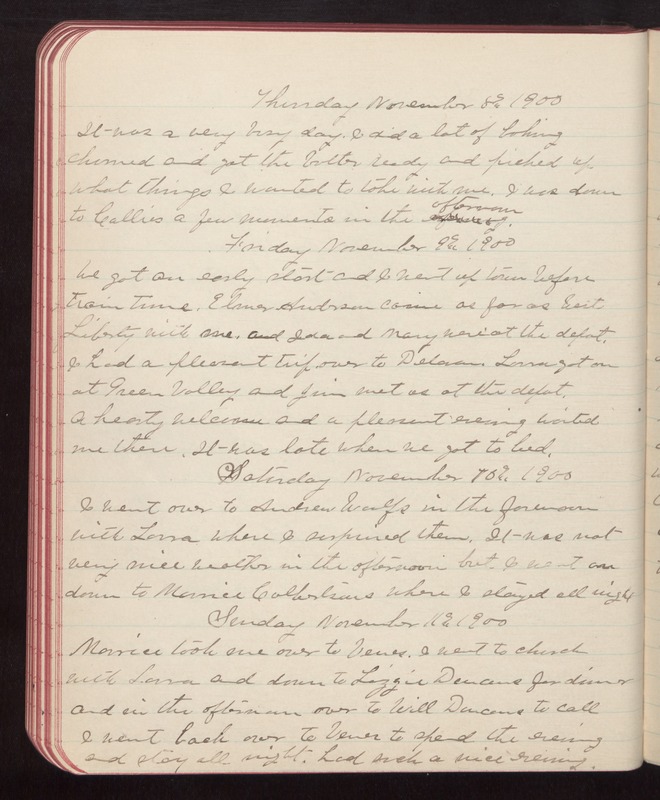 Thursday November 8th 1900 It was a very busy day. I did a lot of baking churned and got the butter ready and picked up what things I wanted to take with me. I was down to Callies a few moments in the afternoon. Friday November 9th 1900 We got an early start and I went up town before train time. Elmer Anderson came as far as West Liberty with me. and Ida and Mary were at the depot. I had a pleasant trip over to Delavan. Laura got on at Green Valley and Jim met us at the depot. A hearty welcome and a pleasant evening waited me there. It was late when we got to bed. Saturday November 10th 1900 I went over to Andrew Woolfs in the forenoon with Laura where I surprised them. It was not very nice weather in the afternoon but I went on down to Maurice Culbertsons where I stayed all night Sunday November 11th 1900 Maurice took me over to Vernes. I went to church with Laura and down to Lizzie Duncans for dinner and in the afternoon over to Will Duncans to call I went back over to Vernes to spend the evening and stay all night. had such a nice evening.